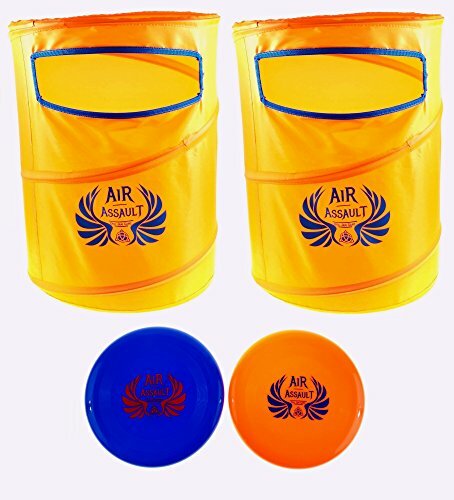 Air Assault - Disc Slamming Game Set - Outdoor Frisbee Dunking Game - Perfect for Tailgates, Family Parties, BBQ's, the Beach, Parks and More! Air Assault is an action packed travel disc game that can be played anywhere! Tailgates, Family Events, Beach, Camping, Parks and More. Teams of 2 players work together to score 21 points to win. Set up each collapsible goal about 50' apart with the disc slot (the goal) facing inward. Team members then stand opposite to each other at the end of the court. While one player throws the disc, the other can assist the disc into the goal by deflecting it with their hands. Each type of assist equals a different point value, and a disc thrown directly into the slot with no deflections and no touches to the goal scores an automatic win. It is a fun and challenging disc throwing game perfect for the whole family. GET ACTIVE WITH AIR ASSAULT - Air Assault is an easy, yet competitive action packed game meant to be played outdoors. Kids & Adults will want to play this at any outdoors event. EASY ASSEMBLY - The targets pop up for quick assembly, and collapse into a small disc for easy storage and travel. STAYS STURDY AND IN PLACE - Air Assault has a weighted base to help keep the targets sturdy and in position! TWO FLYING DISCS/ FRISBEE - Air Assault comes with two 9" team specific flying discs - 1 Orange, 1 Blue. EASY CARRY - The targets come with an easy carry zipper bag that holds them when they're collapsed! If you have any questions about this product by Air Assault, contact us by completing and submitting the form below. If you are looking for a specif part number, please include it with your message.